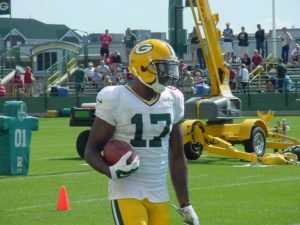 The Green Bay Packers have ruled wide receiver Davante Adams out of Saturday’s home finale against the Minnesota Vikings. There’s a good chance that the Packers will hold Adams out of the final game at Detroit next week as well. Adams suffered his second concussion of the season, taking a blindside helmet shot from Carolina’s Thomas Davis. It’s also Adams third concussion in 14 months. For the season, Adams ranks second in the NFL with 10 touchdown catches, trailing only Houston’s DeAndre Hopkins. He has 74 receptions (12th) for 885 yards (16th). Even more impressive, Adams reached those numbers while Aaron Rodgers was sidelined for seven games. Adams will likely be at or near the top of a strong free agent receiver class. It would be shocking if the Packers don’t reach a deal with Adams before he gets to free agency. Mike McCarthy on Wednesday called Adams the Packers best perimeter player. The Packers and Vikings kickoff at 7:30 p.m. on Saturday night at Lambeau Field.